A few days after the Museum Plaza project was officially and unequivocally cancelled and another historic building was bulldozed in order to make way for, at least in the near to medium term, a parking lot, it seems that the city’s leaders need a reminder that we should be focused less on mega-projects which often call for such demolition, and more on filling in downtown’s horrifically pockmarked landscape. I had some extra time on my hands over the last week, so I took the liberty to mark all of the dedicated-use parking available in downtown Louisville. On the map above, red shapes mark ordinary surface parking lots. 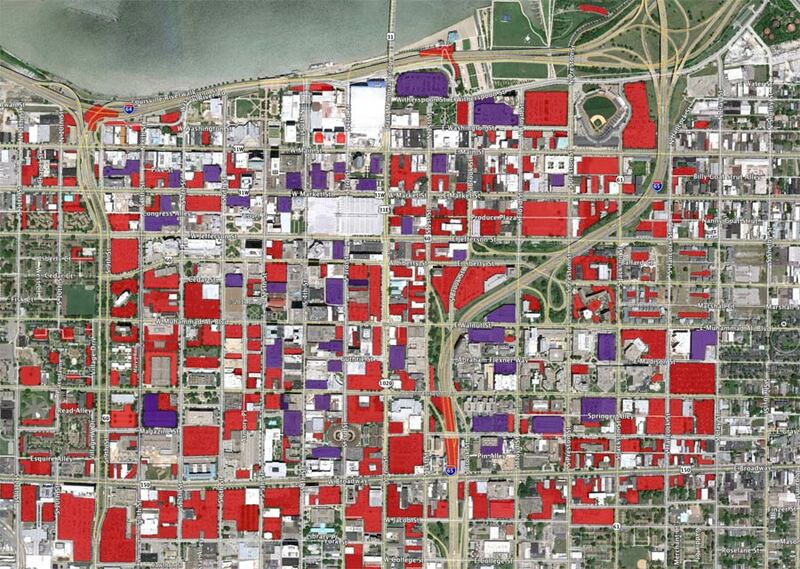 Purple shapes mark structures whose sole use is a parking garage—no ground floor retail or office space above. 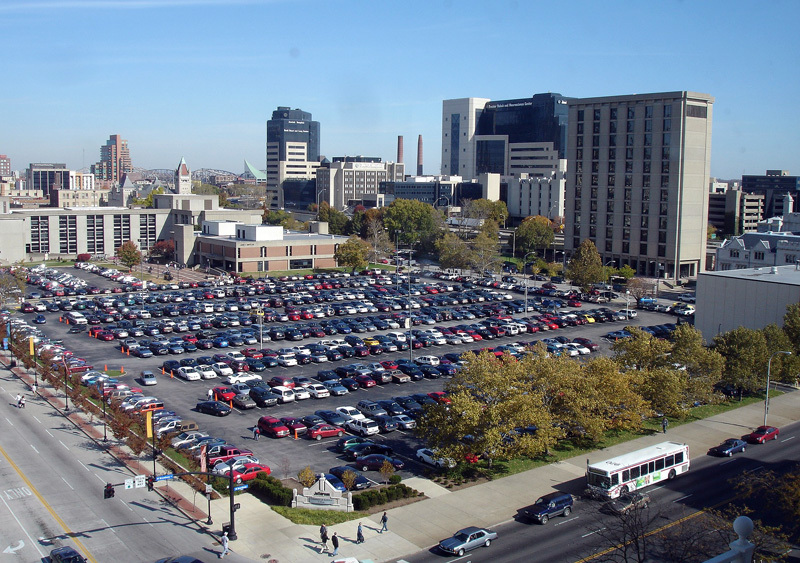 A conservative estimate shows that (probably) at least a third of Louisville’s downtown surface area is occupied solely by parking. (Compare this with Washington, D.C., whose Central Business District has virtually no surface parking) Keep in mind, this doesn’t even include below-grade parking garages which might have something above them, like most of the major office buildings, or some of the parking garages which have retail or offices or something on the first few floors and parking above. When are the developers going to start looking to build on all of this underused, culturally worthless space and leave what little historic fabric there is left alone? In July, the Bloomberg Foundation announced that Louisville would receive a $4.8 million grant to study and improve the efficiency of public works and services. While we work to wring blood from a turnip across the vast array of public and human services, the picture above is nothing more that a glaring indication of inefficiency. Most of these parking lots and garages are privately owned. However, the Parking Authority of River City controls more than 11,000 off-street spaces in downtown—enough for nearly a 6th of the downtown workforce to have their own parking space. The spaces generate some revenue, no doubt, but almost undoubtedly not enough to cover the operating and maintenance costs of this mostly structured parking. Meanwhile, the red parcels generate virtually no property tax revenue for the city at the same time that they blight the community and create unattractive and inhospitable human environments throughout most of downtown. Mayor Fischer should devote some of his new innovation team toward addressing the economic and transportation factors which make it easy or advantageous for property owners to leave undeveloped land as underused and ugly parking lots and the zoning factors which likely make it more difficult for owners to develop their land into more productive and attractive uses. Thanks for putting the map together. The power of a good graphic in conveying a message. Seriously. What’s the point in all that parking if there’s not much to do once you’ve parked? My apartment building’s residents-only surface-level parking lot is among the highlighted red on that map and the photo pictured at the bottom of the article is KCTCS’s lot, which is actually a good example of a compromise, in my opinion, take half of that lot and put a three or four deck parking garage on it, which alone should exceed the capacity of that lone surface lot and put retail/entertainment space on the other half, facing Broadway. During the day, it’s student parking, during the evenings and weekends, parking for the retail/entertainment space, YMCA, etc. Seems like a sustainable option for KCTCS that’s near-term cost-neutral and long-term revenue-positive. If this doesn’t send a powerful enough message, I don’t know what will. I have an idea I need to pitch to Mayor Fischer that might help curb the creation of these parking lots. If you are a good steward to a property that is over a 100 years old, you shouldn’t have to pay property taxes, period. Or, have a property tax surcharge for surface parking lots. 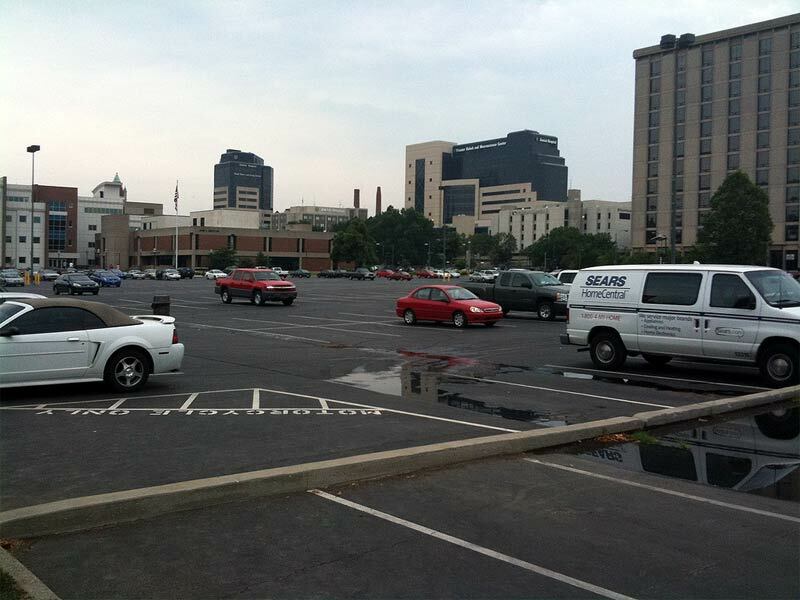 Are the 2nd (ONE OF LOUISVILLE’S COUNTLESS, MOSTLY-EMPTY PARKING LOTS) and 3rd (AN ENTIRE BLOCK OF SURFACE LEVEL PARKING) pictures of the same parking lots only at different times? Yes. The buildings around it are the same. Those surface parking lots sure could use some solar panels, at a minimum. Erik, what software did you use to create the infographic? Thanks. @Kevin – The map is made in Google Earth. If you’re interested, I can send you the the KMZ or KML file. I’d love the file. I’m guessing as an admin you see my e-mail address, so if you do, send it there. Thanks! This article mentions pro-development policy changes that would let parking lot owners put their land to better use. What would these be, and which ones would you most recommend? It’s not really a surcharge, but the fomer PVA, John May, raised all downtown surface parking lot tax rates to reflect the actual value of the land for what it could be, not what it was. The newly updated bills went out right before the election that he subsequently lost to Tony Lindauer. Not sure how many people contested the new rates or if any were successful. I’m sure if somoene was interested they could compare the rates now and before the time I mention. What we have going on here is the same impetus that created 4th St. Live – a phony downtown that will never thrive as long as it alienates the very people it claims to appeal to. So-called “coolness corridors” can not be made, they can only be fostered to full health, and as long as our dear mayor and his many developer cronies continue to eliminate the few authentic, historical sites we have, our puny downtown will continue to sputter both culturally and socially. You want to attract the cultured classes (IE the classes with the money, free time and desire to listen to our near-brankrupt orchestra)? Then leave the authenticity alone. Give people something to relate to and they won’t mind if they have to circle the block twice to get in to a parking garage. Couldn’t agree more, downtown is teeming with surface level parking and single use garages that detract from the experience of being in the area. It’s kind of astounding how few complete corners there actually are in Louisville. For the sake of accuracy though, the garage between Witherspoon and Washington and Brook and Floyd has what appear to be offices on the first floor on the Washington/Brook side. Perhaps someone here can deliver a better answer answer for the commenter than I did. Originally Posted By KevinThose surface parking lots sure could use some solar panels, at a minimum. The JCTC master plan calls for filling in most of the flat parking lot at 1st and Broadway including a student union at the center of property. Given the high demand at JCC they would have already started on the corner building if the economy had not tanked in 2008. Hopefully any future parking structures will house office, classroom or other human activity at ground level. The existence of so many ugly flat parking lots downtown is indicative of the low priority our city’s leadership has placed on properly integrating automobile infrastructure into the urban area. The hideously ugly riverfront I-64 is the most blatant mistake but much of the freeway running through non-suburban areas in Louisville is poorly integrated. There is no effort to correct historical mistakes by building sound blocking walls or planting evergreen trees and vines to lessen the negative impact of the freeways on surrounding neighborhoods. In most areas these relatively low cost measures would have strong returns. A vibrant urban core and thriving urban neighborhoods is what is required to give investors the confidence to develop flat parking lots. Poorly designed infrastructure such as the pathetic downtown ORBP is an impediment to a vibrant central business district. That’s a nice picture of the JCC Downtown lot, but I agree–the first one had to have been taken during summer session or on the weekend. As anyone who gets to class two hours early to get a spot in that lot during the spring and fall can attest–it’s rarely empty when school is in session. As for the other lots downtown? I completely agree they are pockmarks on our beautiful city. Just wish different pictures had been used to illustrate this. DC may have no parking but they have a fantastic subway system that gets you there and home. We have TARC with fake trolleys! @Ken F. – While it’s better than Louisville’s nonexistent subway system, DC’s metro system is a case study in mismanagement and dysfunction. The whole thing is slowly decaying, and at some point it may stop functioning altogether.